2x3 custom magnets 20 mil square corners make a wonderful promotional choice for marketers who wish to make the most of their low budget investments. This magnet with square corner offers authentic flair to any information imprinted against it. Marketers who are working in extremely constrained budget can always place wholesale orders and avail discounts. It makes a brilliant coupon card, business card and many more. 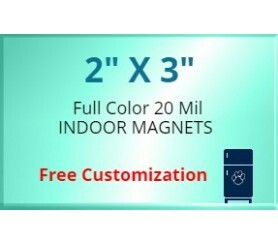 This budget friendly magnet is made in USA and produced using high quality magnetic material. 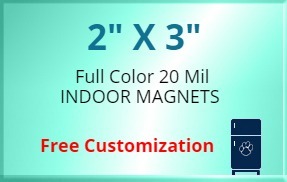 Request a quote to know wholesale discounts on 2x3 customized magnets 20 mil square corners.